During my first visit to Grace's Kitchen, one of my co-diners ordered the Shrimp Burger. He passed over a taste to each of us at the table, and the consensus by all of us was that this was delicious! So, I made a promise to order the same on my next visit. Last night, I did just that. Let's create the scene. Seated in the same room as before (the "Kitchen" inspired room), I sat down barely reviewing the menu. My mind was made up; the only decision to make was fries or chips. (I chose chips, but that's not important to this story.) Focus! Focus! Shrimp Burger - this was not a shrimp patty, but full sized delicious and succulent gulf shrimp pressed together in order to form a perfect "patty", served on an absolutely delicious pretzel roll with Thousand Island Dressing and homemade bread & butter pickles! That shrimp "patty" was thick, juicy and quite tasty. From the first bite all the way to the last "tail", the flavor never wavered. This is some special burger, even if it is not made out of meat! It was good-sized, meaty and had an absolutely perfect combination of the best flavors. What more could I want in a burger? Well, I would have liked to have indulged in a second one! And, those chips that were not important to this story - home made, not greasy, and everyone at the table enjoyed eating them off my plate, including me! So - go to Grace's and get this Shrimp Burger - enjoy the atmosphere, and notice the walls. You might see a tray belonging to my own Mother hanging in the restaurant. And, if you ask for a knife, that tray the knife is presented to you on might be the tray that belonged to my Mom as well! Grace's is named for Johnny Carrabba's Mother. Thanks to my sister-in-law, my Mother is a part of this local treasure as well! Grace's Shrimp Burger - YUM! When a local Houston restaurant pioneer opens a new place in town, the entire city is buzzing with excitement. If that same restaurant offers a burger on their menu, I am the one buzzing. 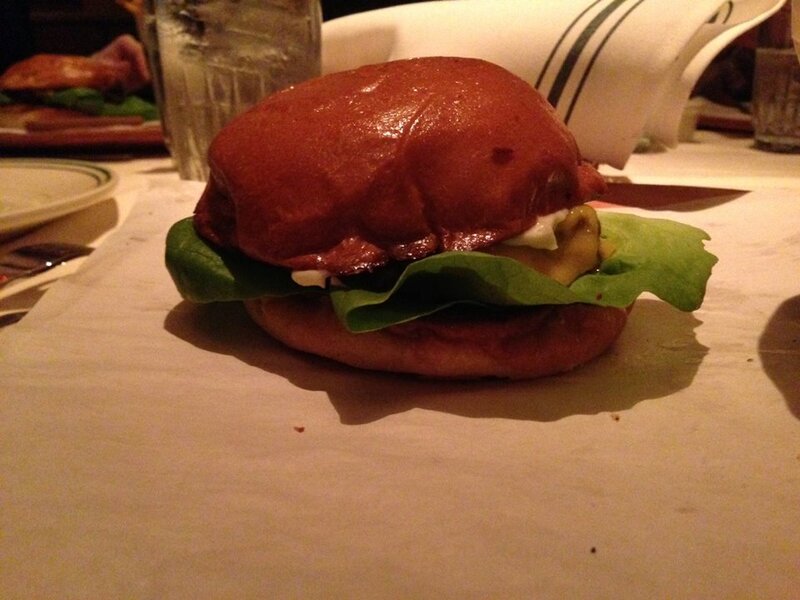 I received a phone call from my brother, advising me that his opening night visit to Grace's (the new restaurant by the famed and revered Johnny Carrabba), was greeted with a burger that I was sure to like. Not a man of much patience, I made sure to schedule a trip to Grace's the very next weekend. I enlisted some close friends to join me last Saturday night. We arrived at Grace's and were immediately impressed with the design and architecture of this new eatery. After a very long wait (Grace's was packing them in during their first week unannounced soft opening), we were finally seated. There was little decision on what I would order - "Grace's Burger" - house ground Wagyu on challah with sharp cheddar cheese. This burger is one I wanted to like very much. In fact, I wanted to LOVE this burger for many reasons. But, as with any new restaurant, time is needed to work out any kinks. The burger was quite good. The meat was flavorful, and the challah bun was a nice sweet contrast to the meat. My disappointment was not so much in the overall taste of the burger, but mainly on its size (or lack thereof), and uninspiring presentation. Bite after bite, I had no complaints. It was a nice burger with nice flavor, but in the end, it was nothing extraordinary. It would have been extraordinary if the burger had tasted badly - but I have come to expect nothing but great flavor from a Johnny Carrabba establishment. I have read that Johnny is still playing with the menu, and making some changes. I applaud him for wanting to improve to get things right. Maybe one of those tweeks is on their burger. All the right ingredients are there, but there is room for improvement. One non-burger piece of advice. Save your time by not ordering dessert. Ours was a true disappointment.